Just a point of information for some folks. Yesterday I was working on some other things in the shop and I saw my rear stock springs laying on the floor off the race car. Now I say "stock" because they are factory, but they are factory WS6 springs and, IIRC, supposedly the highest rate available from the factory based on the tag on the spring. I made a little fixture in the press to see how heavy the springs were. When I was done, they ended up measuring about 170#/in deflection. I thought that was pretty light so I went to my spare parts bin and rummaged around and found another set of stock rear springs. I don't know what their spring number was and they are, most likely, off an '84 4 cyl/auto car. They measured at 145#/in deflection. I bring this up because in parts of the thread people are talking about spring rates anywhere from 200 to 300 pounds, so people have an idea of what the stock springs actually were. When we did this conversion on the roadster a couple years ago, we went with 250# springs just on a guess because of the small block Chevy in the back. It is not too stiff, I don't think. I intend to run about 275# or 300# springs in the rear of the race car, with the stock front WS6 springs cut one coil and a spring rubber in each side, which should stiffen the front springs up by about 30% or so, give or take. Sooooo... logically, 7 in threaded collars would allow more height adjustment? Most places ahve the same price for 5" or 7". And 12" springs allow stock height, 10" springs are better for a moderate drop but still can be adjusted to stock ride height with 7" collars... or not? I want to make sure I know exactly what I need to get. And are these in pairs or single wheel kits...? Because they only show parts for a single wheel on most websites, but I found one that said it was for a pair of wheels for about the same price as everywhere else. and also, is this as good as buying a new coil-over kit? Just got done converting the Koni's on the race car. 7" tubes, made to fit over 2" OD shock bodies. I have over 2" of drop available to me with just the springs touching and unloaded. Total drop would probably be over 3" before the nuts got close to the base, maybe more. Cut the perches off as close as comfortable with plasma cutter. Chucked the body in the lathe and turned the rest of the perch off. Turned the shock body top nut down so it was 2.050" which made took a few layers of paint off the body, maybe a little more than that. For those not familiar, the upper end of the Koni body is larger than the bottom where it bolts to the knuckle, and the nut that holds the seal in is larger yet. If you simply bore the tube out it would be very thin. As it was, after getting the body to 2.050", the tubes would not slip over so I threw the tubes in the oven at 400�F for an hour and then they did just drop over fine. Anything over about 400� is going to cause discoloring of whatever color the tube is and if they're not high quality, it might happen at a lower temperature. All of my parts came from Speedway Motors. They cost a little more, but if you buy more than $400 total, and I needed other stuff, shipping is free and they are overnight to me UPS Ground. They also only care top quality stuff. so, how would i go about making an adjustable coilover? thats what i really wanna know.....how about an adjustable coilover-able to drop it 3 inches? Just do what's outlined in this thread. Of course you're only going to have about 3 inches of suspension travel, but it's your car. so how big of a sleeve/ring would i need to use to get that much of a drop? and also, i heard that aluminum adjustable coilover's are bad, because the aluminum will seize together, is that so with this mod? and one last thing-how do you adjust the height-with an allen wrench? 2" ID, 7" long sleeve. So what else would you like to use? Any metal can seize, aluminum is no different. The allen screw is to lock the setting once you get it where you want it. You need to look at the pictures in this thread and most of your questions will be answered. what i mean to say here, is how much will i be able to drop it/lift it? I built my own coil overs using Monroe Sensi Trak struts and the usual aluminum sleeves, QA1 12" coils etc. They were easy to build, and a little research on stock spring rates led me to use 250 lb/in. springs. They seem to be just right for the stock 2.8 V6 with a front sway bar mounted @ the rear. I thought of switching to 300 lb/in. springs just 'cause everyone seems to use them, but I think that they would "over power" the rebound on the Monroe struts. I'm happy with what I've built!! Ok I am planning on doing this for my wife's car. I have 5 inch threaded collars that I got pretty much for free as I am selling the struts/springs they came on for more than what I paid for the struts, springs and collars. Now I plan on running 300lbs springs. I think I have 325lbs springs on my IMSA Held set-up and they ride nice. My problem is what struts to get. I hear that the KYB's are that great. But what else is there? I know of the Koni's. I have them on the IMSA Held set-up on my IMSA and they need a bigger diameter collar. Or is that just on the adjustables? Any advice is welcomed and appreciated. This is based off the GM manufacturing prints for the springs as well as measurements taken by others. See the link above. I assume you mean 1000 lb front weight? Anyway, 1950 lbs rear axle weight is much heavier rear weight than a stock Fiero. An 88 Fiero is around 1550 rear 1150 front. Mine with a 3.4 DOHC V6 weighed 1650 rear. It's a heavier engine than the stock 88 Fiero engine. With that extra 400 lbs over the rear its no surprise you ha to up the spring rate! 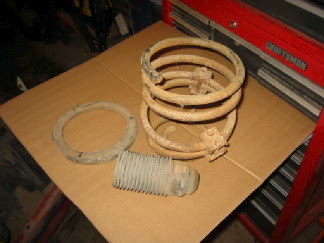 Stock 88 Fiero rear spring rate is 142lb/in. Is anyone making these for sale? Just wondering since I have all the rear end out of my Formula and I need new struts anyway. I'm just wondering what the price difference is. Held and WCF sell kits specifically for the Fiero. I think there are a few other vendors as well. Thanks, but I was looking for somone who is building one of these cheaper alternatives - and selling it cheaper than Held and WCF. Even buying all the parts together would help me out. I never have enough time to get these things together. Send me some struts and I'll cut/turn the perches off for you and send them back to you. All it will cost you is the shipping. I imagine shipping costs will take the total price up to where the other finished coilovers are, but if I get in a pinch, I'll let you know. You da man, John! Thanks! Probably not, if you want new struts I could probably just pick up what you wanted, cut off the perches, and then ship them to you. Depends on what you want, it would save shipping at least ONE way. I've been happy with several brands. In my order of preference, they are Koni's, KYB, then Sensatrac's. Not surprisingly, that's also the order of pricing, most expensive to least expensive. PM me if you want to work this out. The Konis need a little more machining on the body and the 2" ID tubes have to be heated to almost 450� to slip over the belled top of the struts, but they DID go over the Koni's on the race car. It did take the anodized finish off of the sleeves though. I also apologize for seeming to be a little short with you. I don't know of any steel sleeves being made and that would really be the only other material. You have to remember that it's not something you're going to normally change every day on a STREET car. It does get adjusted regularly on a race car to put wedge in the car, but normally once you set your ride height on a street car, you leave it alone. The threads are fairly coarse and while I'm sure it CAN seize, I haven't had one do it to me yet. There are a lot of pictures in this thread and I don't know what else one could add to it, but if there is a particular step in the process you're unclear of, post it and I'm sure that someone can either post a picture or point you to one in the thread that you might have missed. No matter what material, to drop the car 3" you are taking about 50% of the travel out of your strut and that translates into leaving about 3" of suspension travel before bottoming. It's also going to make the car extremely difficult to drive on the street through dips and over speed bumps, so be aware of that as well. You're also going to have to lower the front end a like amount, naturally, or the car will ride WAY nose high. a 3" drop on springs alone means some lowering springs (and I don't know of any of those that will give you 3" of drop) or cutting at least 2 1/2 coils off your front springs. That will put the suspension nearly on the front bump stops as well so they will need to be trimmed or removed. It's your car, make it to your desire, but just consider the practicality of what you're doing while youre at it. Thanks, John. I will check out the struts and other parts I need and get back to you. I also need to look this thread over a little closer to get a better understanding of how these go together - and where to get the other parts needed. I want to do this one the 84 V8 Fino for sure, but I'm not sure if it is worth it on the 88 Formula because I may be putting it up for sale to fund the Fino improvements. Just so you know, to use the 2" ID sleeves you almost MUST have a lathe to turn the tops down on the struts, the Koni's are belled at the top. Yea i kinda knew that. I have a set on my IMSA but was hoping thye changed that. Guess not. The rubber belt that he used can be purchased at Tractor Supply. I saw it there. At this point you now have the spring removed by someone else unless you had the correct equipment/skills to do it yourself. I tried using an impact with a 21mm socket to remove the top nut that holds the upper retainer plate to the strut shaft, I then had to use a 21mm wrench on the nut and a 10mm wrench on the shaft to remove the nut as the shaft spun with the impact. 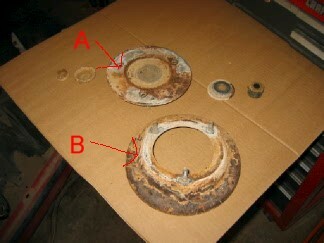 The next pic shows the coil retainer "A" and upper spring perch "B" along with 2 washers and the 21mm nut. The small bushing on the right is actually the center of the dust boot, it had seperated from the boot. The next pic shows the spring, rubber cushion from the upper spring perch and the dust boot, all of which are no longer needed. The next pic shows the bare strut. 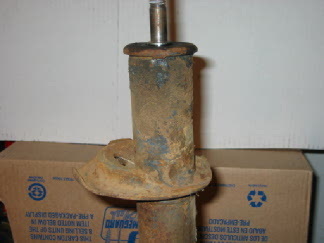 You need to remove the lower spring perch from the tube and grind the top of the strut to the same diameter as the tube. Just Dremel, file or grind the weld away to remove the perch, try not to put too much heat into the tube just to be safe and don't grind a hole through the side of the tube. Don't you need a spring compressor? Isn't that spring a loaded gun at this point? Those rusted things are small springs compressors people installe to lower their car without changing or even removing the springs. The springs were probably already enough compressed by those to avoid the need to use a spring compressor here. You are correct, to play it safe once you get the struts out take them to a service station and pay a couple bucks to have them taken apart safely. What part number for the Sensa-Tracs? The ones I just looked at (for 84 Fiero) could not be modified for use. It had a feature at the end that couldn't be removed that was larger than the strut diameter. If stock rear springs for a v6 are 142lb/in why are many looking for 250lb/in? I just want some lowered and ride stiffness similar to stock. I'm going to use 300# QA1's because I no longer have the stock drivetrain. I have a 4.0 Aurora with the boat anchor sized 4L80E. Bump. Can someone explain? Seems 250# springs would be stiff as compared to stock. From: Chatsworth, California; Clearwater, Florida, and Milwaukee, Wisc. Imagine a stock spring with a rate of 150 lbs./in. of compression. Say total movement of the suspension is maximum 6 in. in full compression. That would be 900 lbs. of force to compress the suspension fully as designed. If you lower the car 2 in. you are left with 4 in. of total movement before fully compressed. To prevent the suspension from bottoming out prematurely, you would want at least 900 lbs. 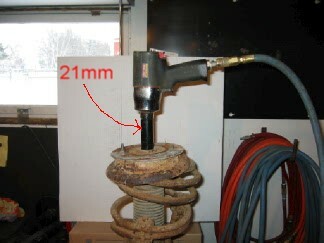 force to still be required to fully compress the springs. So your new springs would probably be rated at 225 lbs./in. as a starting point. Your street ride is compromised to some degree no if ands or butts. Spring makers have some tricks to moderate this but they increase cost and I doubt that is done for Fiero springs. We are after all, the cheapest hobby car owners in the known universe. I understand. Thanks for the explanation! Anyone else have problems getting this nut to break free? Finally! PB Blaster, impact wrench, elbow grease. Finally got it.